Ahoy Salt Lakers, here's something to be completely stoked about. 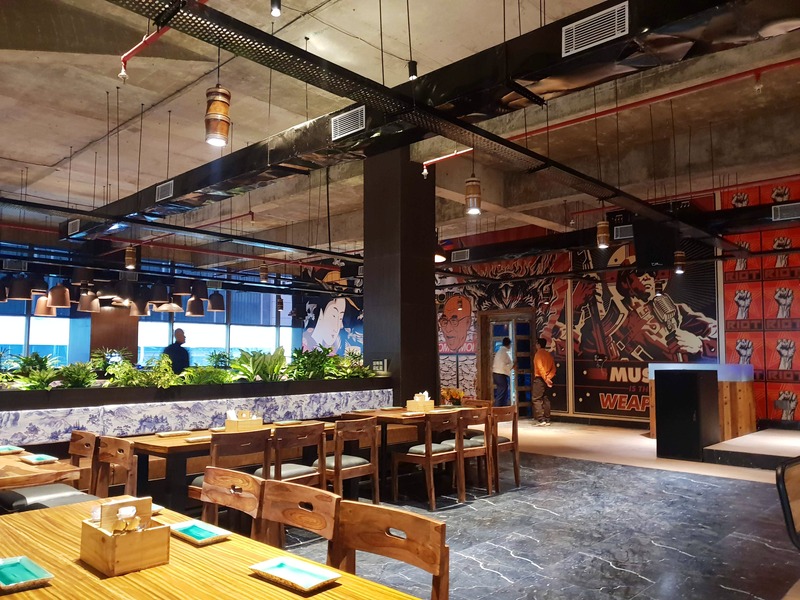 You can now check into the just-opened Momo I Am Cafe , Cafe I AM, to gorge on some delicious momos and chill with a tasty drink from the bar, and let the rest of the city go green with envy! Huge and sprawling, and magnificently done up with graffiti murals (crouching tiger to the Dalai Lama and the astronaut), this much awaited cafe is located on the first floor of RDB Boulevard. It's tempered with indoor plants, large Buddhist curios (the huge brass Buddha will definitely bring you some peace) and quirky artworks running through the walls. We sat by the windows over looking the technopolis of Sector V and legit felt like we're dining in some upscale eatery in a fancy city! Unlike the other Momo I Am outlets, this Cafe I Am will let you have your alcoholic drinks while you gorge on your fave Tibetan food. Going all cosmo, the cafe will also have an addition of continental fares to its menu. There's new things to try for the Asian/Oriental food fans too. Pork ramen, salt and pepper squid, mini taipo (stuffed buns) and claypot dishes are the must-try new things. Soup baos (aka Xiao Long bao) are the newest trend in the city, and Momo I Am Cafe has it for you to sip and bite. You’ll also find Momo I Am pickles and condiments in packed jars for sale here. Keep tabs here to know more about new food addition and events coming up in this cafe. They are yet to get the liquor license in place (they'll be serving liquor from the third week of December). Till then you can hit up here to enjoy some tasty mocktails from the bar! A meal for two (without alcohol) would cost you around INR 1,000.